Introducing Davina and Justin, the very first couple to sign up to the Wedding Wishing Well Foundation’s Gift List. 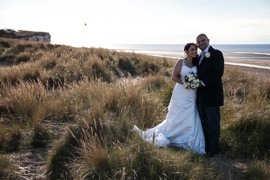 The couple got married on Saturday, 5th October 2013 and, to date, have raised £1,155 for TWWWF – an incredible amount that will enable the charity to help even more couples to have the wedding day of their dreams. If you are due to get married soon, and have been searching for unique Gift List ideas, consider following in Davina and Justin’s footsteps. The donations given by your friends and family can help other brides and grooms to experience a wedding day every bit as special, and memorable, as your own. So how does the Wedding Wishing Well Gift List work? These days, more couples than ever are living together and building their homes prior to marriage – rather than struggling to name items that you need (or risking receiving yet another toaster…), why not ask your friends and family to instead make a donation to the Wedding Wishing Well Foundation on your behalf? Every penny of their donations will go towards helping couples affected by terminal and life-limiting illness to tie the knot. Naomi Thomas, founder of the charity, says, ‘Whatever the reason, incorporating charitable giving into your wedding lets couples share what’s important to them when time is really of the essence’. Remember: Your day can make a difference. 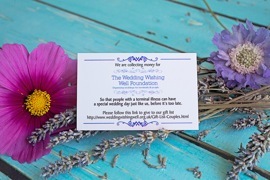 Sign up for the Wedding Wishing Well Foundation’s Gift List for your special day, and help couples affected by terminal and life limiting illness to enjoy the wedding they deserve. Already married? The Wedding Wishing Well Foundation is also grateful for any wedding-related items that you may be able to donate. Please take bridal gowns, bridesmaids’ dresses, shoes, jewellery and accessories, and groomsmen’s’ outfits to your nearest Johnson’s Cleaners and become part of the Wedding Outfit Amnesty. Marking the beginning of Breast Cancer Awareness Month, the Breast Cancer Care Show is an event not to be missed. Hosted in the magnificent Great Room at the Grosvenor House Hotel, this year’s extravaganza was attended by a number of celebrities, who came together to enjoy Champagne, fine dining and fantastic entertainment; all for a good cause. Celebrity ambassadors and patrons for Breast Cancer Care, Edith Bowman and Denise Lewis, hosted this glittering event, which was divided into an afternoon tea and evening show. Entertainment included Ray Quinn, the Dixie Dinahs, David Thaxton, and Odyssey, while one of the show’s main features was a Live and Silent Auction, which included a multitude of money-can’t-buy items that the audience could bid for. However, by far the highlight of day was the glittering Cat Walk Show, this year styled by Hilary Alexander, with make-up by Ariane Poole, hairstyling by Sassoon, and clothes and accessories from M&S, River Island, Accessorize, Jane Norman, Coast, and online fashion retailer Boohoo.com; to name but a few! The fashion parade very much reinforces Breast Cancer Care’s “Body Image” campaign, which promises that it is possible to look and feel fantastic following a cancer diagnosis; each of the models taking part has been diagnosed with Breast Cancer. Being diagnosed with Breast Cancer is devastating, both physically and mentally, and can drastically impact upon a person’s confidence and body image. Each of the show’s models, though, exuded confidence and beauty, and was a true inspiration to all of those who looked on. With their “Body Image” campaign, Breast Cancer Care is there to inspire this confidence in others who have received a Breast Cancer diagnosis, supporting them through physical and emotional distress, and providing information, support, and reassurance. One of this year’s models was Naomi Thomas, the founder of a very special charity. After an initial diagnosis back in 2009, Naomi received the devastating news that her cancer had returned just a short year later. 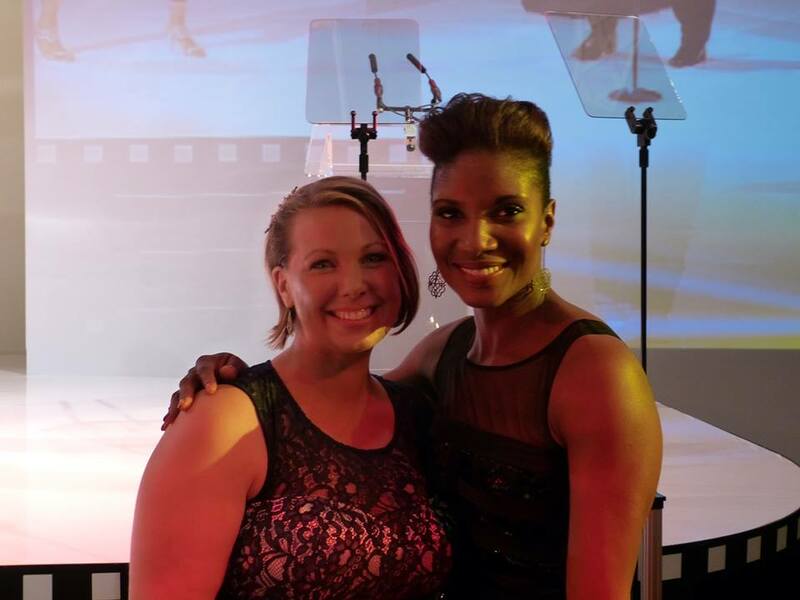 Though she now lives with terminal secondary Breast Cancer, Naomi has never let this diagnosis get in the way of making others’ dreams come true; She founded The Wedding Wishing Well Foundation with the aim of giving couples affected by terminal or debilitating illness the wedding of their dreams. 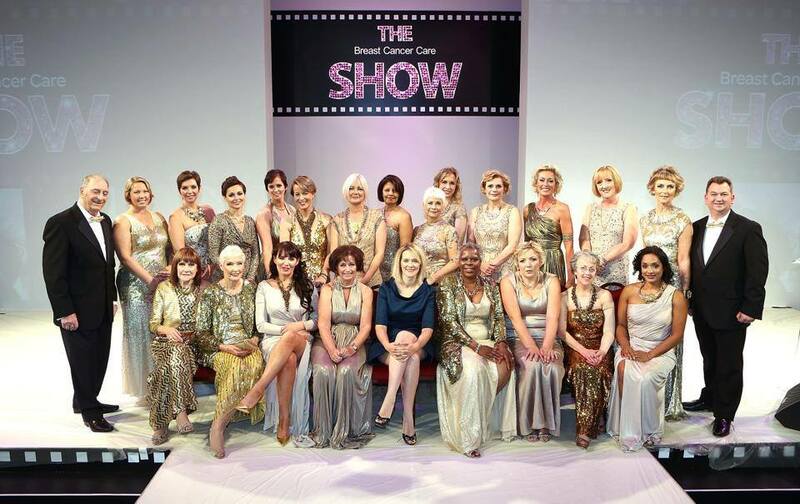 This year’s Breast Cancer Care Show raised a fantastic £350,000. To put that into perspective, that’s: 175,000 headscarves, helping to boost the confidence of those who have lost their hair during treatment; 6,730 HeadStrong appointments, which aim to help women cope with the distress of losing their hair; or 2,651 opportunities for someone diagnosed with breast cancer to connect with a trained volunteer and share their experiences, hopes, and fears. It’s amazing what can be achieved when we all pull together. Billed as the South West’s premier bridal experience the Westpoint Wedding Show will be taking place this weekend (12th-13th October), with over 150 fantastic stands offering inspiration, discounts, and samples to couples planning their nuptials. This most prestigious of wedding shows features helpful demonstrations and daily catwalk shows, showcasing lines from the likes of Sassi Holford, Kate Walker Bridal, Pirouette and Serenity, Catwalk 09, Coast, and Frilly Frocks, as well as Lugets, Moss Bros, and Jonathan Hawkes for the grooms in the audience. Other highlights include a licensed Champagne Bar, Casino Corner and inspirational makeovers, while many of the exhibitors will be offering exclusive discounts to couples at the show. As if that wasn’t enough, every entrant to the show will receive a complimentary show guide and goodie bag, packed full of surprises. This year’s WestPoint Wedding Show is particularly exciting for the Wedding Wishing Well Foundation, as we will be exhibiting for the very first time. Come and visit Naomi Thomas and the team and find out a little more about the work we do, while discovering how you (and your wedding day) can provide the valuable support we need. Our Wedding Wishing Well Gift List gives couples, and their guests, a chance to fundraise as they celebrate their special day; instead of receiving gifts, consider asking your guests to donate to the Wedding Wishing Well Foundation instead, and help couples affected by terminal illness to enjoy the wedding day they deserve. So whether you’re searching for a photographer, florist, confectioner or entertainer, or just want to pop in and say, “hello” to Naomi and the team, come along to the Westpoint Arena this weekend – it’s guaranteed to be a jam-packed weekend. The Westpoint Wedding Show is open from 10-4pm both Saturday and Sunday. Tickets cost £5 when booked in advance, or £7.50 on the door. Group tickets for four people can be purchased in advance for £15.